I’ve been looking at getting a wheel for some time now and I want something that will be able to do just about anything. I’ve never owned a wheel before and this weekend will be the first time that I will be able to try some out. I have been looking at this one for quite some time, though. It’s a beautiful wheel and would do just about anything I would want to try. I’m a farily new spinner, though, and my question is: would this be a good wheel for a beginner? I know the basics about spinning and have used a drop spindle plenty of times, just not a wheel. Wow! Very thorough review. Have you done others? So you like your new wheel :) she is beautiful. I really want to try one of these now (I’ve been considering a second wheel). If you have never used scotch tension before is it a hard learning curve? I have a Louet now. I have the Rose, too. My first wheel was the original Schacht Matchless, back when it was only a single treadle. When it came time to buy a new one, I did a lot of research and found that the Rose is designed to spin very fine yarn (which is what I spin). The Schacht never had superior control; the wheel always moved down a little bit when I stopped. Not so with the Rose. I agree with you – it’s the best wheel I’ve ever seen for the money. It stops on a dime and stays put. I just love mine. I also got the tensioned Kate and if you’re really into plying, it’s well worth the money. Besides that, it’s as beautiful as the wheel. I just got a Woolee Winder for it and if you get the chance, get one. It makes the spinning experience that much more pleasant. I love the Rimu patterning, too – it’s such a beautiful wood. I think that, for me, this is by far the best choice. I’ve never spun on a Golding, but I also don’t care to spend $5K on a wheel, no matter how gorgeous it is. No questions, but a big smile: we are now “cousin by the wheel”, as I own (and love very much) a Suzie. Amazing instrument! Thanks for the fabulous review! It’s nice to read a more human review than JUST the numbers. I’m envious of the fine spinning abilities! And of course, of how lovely the wheel itself is. Can’t wait to see what comes off of the bobbins! Thanks for the detailed review….as you know from the Ravelry board, I’m almost ready for my next wheel, and after spinning on a Rose, am flummoxed about my decision between that and the Matchless now. You can make the lazy kate that came with the wheel tensioned. Tie the carrying strap onto the holes like they instruct you, and when you’re ready to ply, drape the carrying strap across the top of your bobbins and hold it in place with clothespins attached to each side. I do it all the time; it works great! I think my post got ate, which stinks, but what I said was: you can make a tensioned lazy kate out of the one that came with your wheel by draping the carrying strap across the top of the bobbins and then clipping the strap to each side of the box with clothespins. I do it all the time for making chained singles, 2 and 3 ply, and it works great! Oooh, pretty pretty. My friend Julia has a Rose, and they are so beautiful in person – she loves hers, too. Also, I’ve seen several people spin on hers, and though I know *nothing* about wheel spinning, it was interesting to see how differently people spun on the wheel; it obviously isn’t limited to one “style” or speed. Between your comments and hers, this is definitely on my must-try list!!! I thought I posted a comment, but it’s not here. Anyway, to get rid of the slight whir on the bobbin, scrape the inside of it with a sharp knife and it will loosen out the bits left after unmolding. 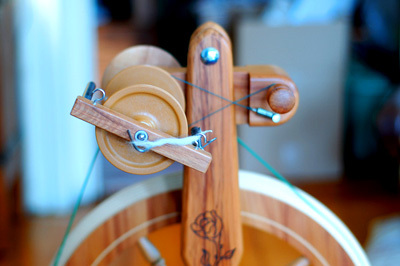 Beatiful wheel, but I wondered why it is particularly a couch wheel, I have a double treadle louet and have been couch spinning all my spinning life…am I missing something even more comfy? It’s not a spinning wheel question(although it is gorgeous) but actually a drop spindle question – how easy is it to learn? Can you spin nice yarns with it. I’m really interested in spinning & definitely cannot afford a wheel! Plus, I’m sure that a spindle is the way to start. Any suggestions? Liz-I got one of the Hello Yarn spindle kits and once you get the hang out it’s easy! Keep practicing and the yarn only gets better looking. There are some good books out there too that have lots of pictures that help explain the process of drop spindling. I have the Rose and I LOVE it. When I got ready to buy my first wheel, I was explaining to my husband that I was worried about spending so much on one and that I thought I’d be better off getting a “starter” wheel, which I could sell someday when I got better as a spinner and wanted to upgrade. He said I should just get the good wheel to start with. The thing is, I think this wheel made me a better spinner right from the get-go. I remember not liking the plastic bobbins at first but I’m over it now. The only problem I have is with the sliding hook; I find it hard to fill the back part of the bobbin without the hook hitting the body of the wheel. Do you turn the hook around or anything when you get to that end of the bobbin? I was so sure you’d get a Lendrum, but I was wrong! ;-) Enjoy your Rose. I’ve never tried one myself, but I understand they are the top of the Majacraft line and universally loved by their owners. Great, thorough review. I agree completely. I love my Rose and doubt that I could ever outgorw it! Great review, I am going to be purchasing the Rose shortly as my Lendrum ST isn’t my favorite. I need a double treadle badly to take the load off of my one leg. Lovely little wheel and a very thorough review. In reply to “is there something more comfy than couch spinning?” – Yes, there is. I have a Womack Electric Spinner on the table next to my recliner. No need for any foot action here. Thank you so much for posting your review. I appreciate the fact that you address all of the facets of this wheel. I am getting ready to purchase my first wheel, and I am seriously considering the Rose. Thank you so much for the great review! A friend just got a Lendrum and I have been watching her spin with great interest. I ordered myself a Golding drop spindle and some fiber to teach myself on and, if all goes well, will start to save up for a wheel. I am pondering the Lendrum, Schacht Ladybug/Matchless and the Majacraft Rose, but don’t live near enough to a dealer to try any of them out (other than my friend’s Lendrum)… any thoughts? After your review, I am leaning toward the Rose. You mentioned it starts at 650.00 retail, is that for the Rose or other Majacraft models? I can only find her for 850.00 and up. In response to Lisa / Post #27: The price listed in this review is from 2007, but you can find the wheel now at Woolly Designs (US dealer) for about $600 since they offer their Majacraft wheels at the rate of exchange plus a nominal profit added. Shipping is free. I’m ordering my Rose next week! Woot. I have Majacraft Rose. I bought it from a friend who needed money to move. I have spun sucessfully with it Oct-Dec 15, 2009. The drive band keeps slipping off the whorl. How do I change the drive band? I haven’t found an answer yet. I’m sure they’ll be able to help you. For one thing, they have all the manuals online there, available for download. I’m sure the manual for the Rose explains about the drive band. Good luck! Thank you for this review! It helped me a great deal. I have a Majacraft Rose. Really enjoy it. I bought a ply kit and am having difficulity plying. Plying is hard and not as smooth as regular spinning. Since I bought this wheel from a woman who needed money to move, I had no instruction on this topic of plying. Can you suggest a site to get the answers to my questikon or provide any answers. I have been trying to get onto the Yahoo groups for Majacraft and have been denied. Don’t know why, but there, I thought that I would be able to gather information from other Majacraft owners. i completely agree. the rose is a fabulous wheel. i learned on this wheel and felt a great sense of loss when i returned her to her owner. now i have my own and continue to be very happy with it! I brought a Rose at Christmas, last year. I am having trouble starting off. I had a beginner wheel and was just about getting OK but apart from anything else, it is just the most beautiful looking wheel. Can you comment on the difference between an Ashford Traveller and the Majacraft Rose. I am having difficulty deciding. Do I go with my head or my heart LOL I am learning on an old wheel style wheel at the moment, but I would like to purchase a good wheel to go on to that can handle a range of yarns. I saw a rose being used and was impressed with it’s speed, quietness and elegance. I can understand the comment from other people that the Rose ‘spoke’ to them! Another question. BTW, Im starting to get better, Yah!! Question is: Can I spin reasonably bulky wool on my Rose. (When I get it that is!!) I have a small flock of sheep, and the idea of being able to shear my sheep, spin the raw wool, and create a farmer’s type jersey appeals to me. Can I do that on the basic Rose Spinning Wheel or would I need another attachment?